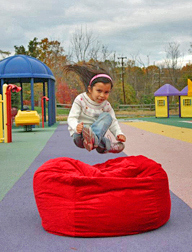 By the way, if you want to send us your own bean bag photos for our website, PLEASE do! Just email us a digital-photo or mail us a paper-photo and we'll do the rest! 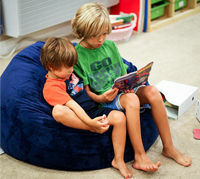 "I love my bean bag!! I am a middle school librarian and the kids fight to sit and read in it. The best part is not only the great quality of the bean bag, but I can also take off the cover to wash it when it gets dirty! Thank you for such a great product!" - H.B. 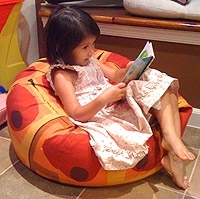 Chloe loves to read in her small Martini bean bag. Phillip is a 3.5 foot terror. When he's not getting into mischief, he takes his down-time in a 37" Eggplant Taffeta. Chloe is 3 feet tall. 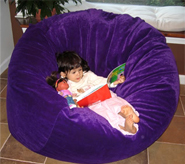 She loves to read in her giant purple velvet bean bag. 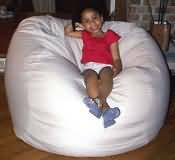 4 teenagers piled on 2 of our 37" bean bag chairs. 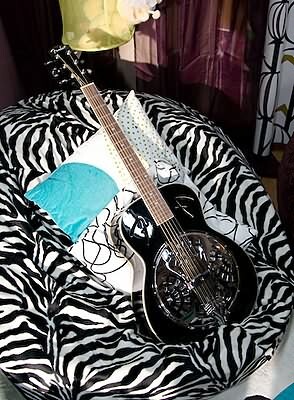 5'7" gal strummin' on the guitar in a 52" zebra fur bean bag. Just lounging around. 52" zebra and 37" eggplant velvet shown. Our 52" size as a love seat. This bean bag has gotten flatter with use. Jackie is 5'2", Nico is 6' tall. India is a 4 foot tall aspiring actress. She is seen here in a 27" Cheetah Long Fur. India relaxes in a 32" Martha Stewart Woven. 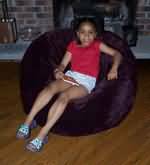 India relaxes in a 37" Eggplant Velvet. India relaxes in a 52" Light Tan Velvet. Jackie is a 5' 2" tall entrepreneur. 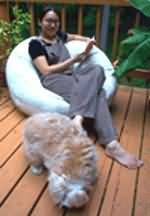 When she has a few seconds free, she spends it in a 27" Fun Universe bean bag chair with her dog Mogwai. Jackie is reading in a 37" Martha Stewart Woven with her dog Moppitt. Dan is 6' tall, checking his phone in a 37" Cuddle Soft. Dog & cat are comfy too! 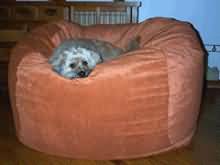 Jackie relaxes in a 52" Microfiber Core with dog Noki and a 52" Terracotta Velvet. Nico is a 6' tall musician. He is bonding with Mogwai in a 27" Fun Universe. Nico is catching up on current events in a 32" Martha Stewart Woven. Nico relaxing in a 37" Eggplant Velvet. 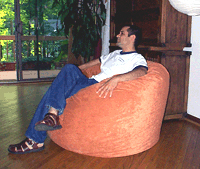 Nico relaxes in a 52" Velvet Ahh bean bag chair. 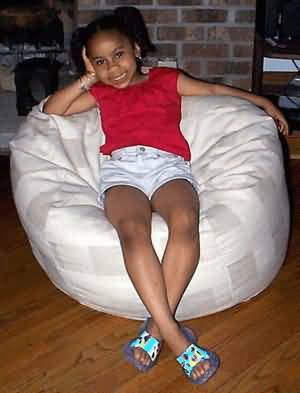 Nico sits in a 37" Cocoa Waves bean bag and 27" Corduroy bean bag. Taha is a 5' 10" tall father of 2 beautiful girls. He finds time to sit in a 52" Terracotta Velvet and a 52" Olive Velvet when he's not playing with the kids. Hailey just loves her Blue Jean. 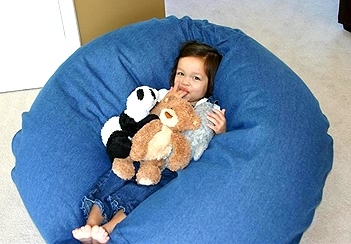 Hannah feels comfy and safe in her 37" bean bag. Brotherly love in a 37", awww! Jerome is a 6' tall record label CEO. He is seen here toasting to a 52" Terracotta Velvet. Moppitt is a 1' 6" tall Maltese Mix dog (from shoulder to floor). 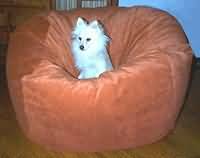 He loves this 27" cotton Ahh bean bag chair. 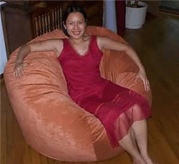 3 cats (Nutmeg, Hurricane, and Valentine) are lounging around in a 37 inch Zen - Red bean bag chair. They've considerately left the adjacent 27 inch matching beanbag for their parents' personal use. Thanks for sending this in! 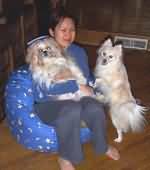 Noki is a 1' 6" tall Mini American Eskimo dog (from shoulder to floor). He just won't get out of this 52" Terracotta Velvet. Nugget is enjoying one of her favorite spots (other than Mom's lap). Nugget is almost 9 years old, weighs about 10.5 lbs and is enjoying the 27" microfiber (so soft!) 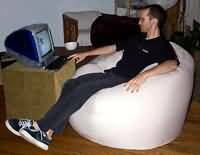 Ahh bean bag (light tan). Thanks for sending this in! Jazzy is a 2' tall Tibetan Terrier dog from the Himalayas. Jazzy relaxes in a 37" cotton. 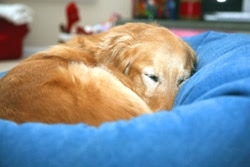 Cody is a full grown Golden Retriever napping in her 37" blue jean bean bag. Jazzy loves to snooze in this 52" Terracotta Velvet. 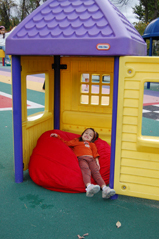 37" premium size fun at the playground!